The principal international challenge for India in the coming years has to be coping with China's rise and growing assertiveness. Beijing's reminder of this country's 1962 military debacle is an over-the-top response to a relatively minor Sikkim border stand-off, quite apart from it failing to recognise India's current military capabilities. But if we are not tone deaf we should take note of the increasingly arrogant nature of China's public protests which matches the message in private conversations. The Chinese have taken to telling their Indian interlocutors to bear in mind the 5:1 disparity in the sizes of the two economies. The message is clear: India should acknowledge superior Chinese power, and behave accordingly. 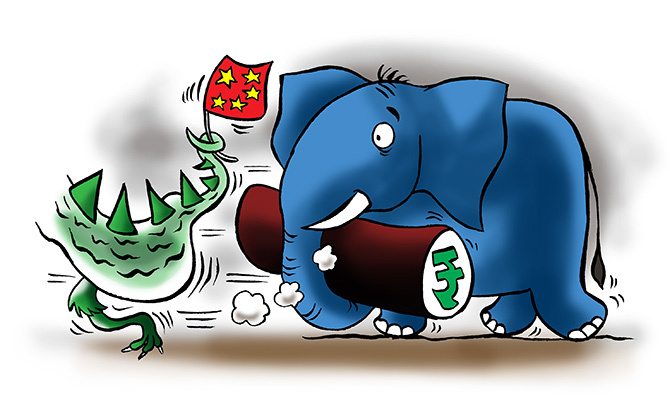 India has refused so far to overtly acknowledge any power imbalance, or it would not have stayed away from the Belt and Road conference recently. But however much India's global profile has been helped in the most recent decades by improved economic performance and success in the infotech services business, buttressed by the older soft power attributes of a values-based democracy, the fact is that India suffers from a growing power imbalance with China. This imbalance has become increasingly evident in trade, capital flows, technological capabilities, military power, academic wattage and access to resources. It is evident also in the diplomatic heft that comes with initiatives like the Belt and Road, the softening posture that Donald Trump displays to Beijing, and China's success in converting rocks in the South China Sea into military bases -- new facts on the ground that no one dares challenge. The popular narrative just now is that India's international profile has improved because of Narendra Modi's personalised style of diplomacy. That is as it may be, but it does not take away from the hopeless imbalance in bilateral trade with China, the colonial structure of such trade (export raw materials, import finished goods), the inroads that Chinese companies have made into Indian markets, the international transport linkages that China has built to gain access to resources like Central Asian gas, the trends in currency values, and China's geographical outreach into the Indian Ocean. In military terms, the last five years have seen the Indian navy add all of eight major combatant ships, while four older ones have been decommissioned. China, in contrast, has added more than 30 such ships, of which about a third or more are with its southern fleet. India still imports most of its air force planes while China is developing its own fifth-generation fighter. In Tibet, China's building of railway lines and roads have dramatically improved its capabilities for rapid military mobilisation and mobility; Indian catch-up efforts are as slow and patchy as ever. While India's defensive posture on the land border is still credible enough to be a deterrent, the vulnerabilities exist. Meanwhile, all of India’s larger neighbours have stronger trade and also military ties with China than with India. Few things can be more galling than China building a highway and pipeline through Indian territory in Jammu and Kashmir. All of these underline India's lack of relative power. The standard response for a country faced with such power imbalance is to seek partners or allies. But countries acting in concert (as India and the US are doing to track Chinese submarines in the Indian Ocean) rarely manage a credible response to the assertion of raw power. If one recognises that India's most recent economic record has put an end to hopes of game-changing action, it is all but certain that the inequalities vis-à-vis China in technological and institutional capabilities will become ever more manifest. At some point, the perception of India as a counterpoise to China will lose credence. New Delhi's strategists should either accept that eventuality, with all that it implies, or up the game through real change and not just bombast or posturing.